Based on the popular UK cartoon series of the late 80’s-early 90’s, Count Duckula is a vegetarian Duck vampire who feasts on ketchup instead of blood and is more interested in pursuing fame and fortune as an entertainer than in becoming a proper vampire. Count Duckula is set in a graveyard just outside the grounds of the Count’s haunted castle. The animation and characters replicate those in the original cartoon, while the soundtrack is a somewhat upbeat, 80’s synth-based affair, interspersed with the occasional spooky sound effect, especially when a bonus win might be near. The low-value symbols are taken by the J, Q, K, and A while the higher value symbols are represented by Duckula’s Coat of Arms, his cuckoo clock, his giant organ, the haunted castle, and the Count himself. This is the highest paying symbol where five in a pay line will earn 500 coins (still only 12.5x the spin stake, however). The other symbols are a wild, symbolised by a stake through a heart, and the scatter symbol which is a gold framed picture of Count Duckula. There are also appearances from other series regulars such as Duckula’s butler Igor, his housekeeper, Nanny, and his nemesis Dr. Von Goosewing. 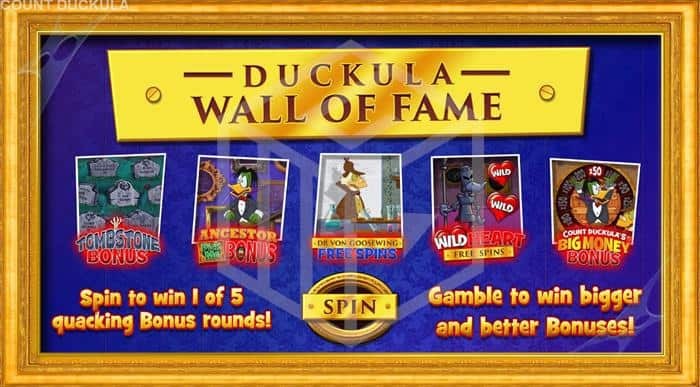 As with many of Blueprint’s releases, Count Duckula keeps its players entertained by offering up a wide selection of possible bonuses including four which are randomly triggered in the base game, and six possible features during the bonus round. 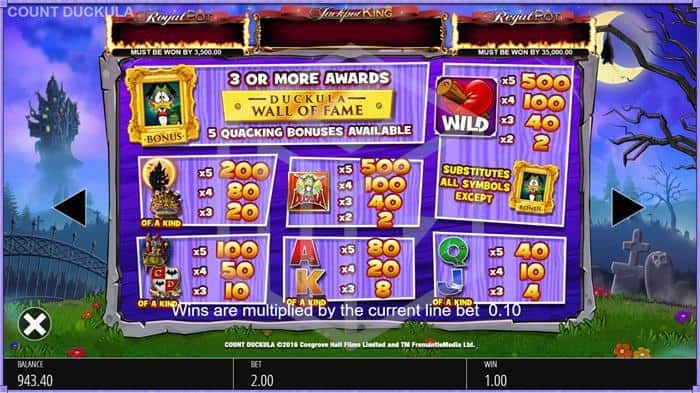 Wild Heart Free Spins – Your chances of winning with these 10 free spins are even greater as the board changes from 5x 3 reels to 5 x 4 instantly doubling the number of pay lines. Also, every time you land a wild heart symbol it will be collected and at the conclusion of the spins, the hearts will randomly occupy spaces on the reels for one final spin. You also get a chance to retrigger this final spin multiple times for even bigger wins. 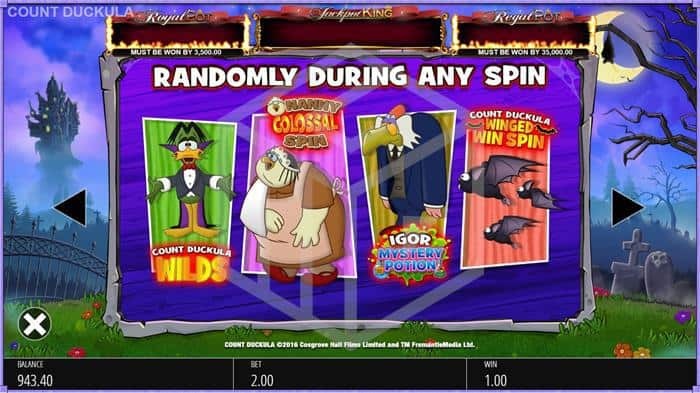 Count Duckula’s Big Money Bonus – Duckula is tied to a money wheel which you spin to hit money multipliers. Land on the same segment twice and the bonus is up. Rapid Fire Cashpot Bonus – Either landing on this bonus or gambling your way up is how you can potentially make the biggest profit. The cashpot meter is shown by the amount of ketchup in the meter. There are three levels of cashpot, with the meters all visible throughout the game above the main game board. Hit the big one and you’ll take home a decent progressive jackpot. Count Duckula does a great job of staying true to the original cartoon series with great attention to detail and a fun design. There are also some really fun features included in the game, and it’s nice to have the option to gamble to a better feature and potentially to a large progressive jackpot. That being said, unless you happen to have been a child growing up in the UK in the 1980’s like this reviewer (and let’s face it, you probably weren’t) then the backstory will be lost on you and it’ll just be another nicely animated cartoon slot. Furthermore, despite some great features, there is really no getting around the fact that with just a 93% RTP, the house edge for Count Duckula is twice that of a lot of equally fun slots, so be sure to factor that in when you plan your session.